Feel the thrill of skydiving without jumping out of an airplane without the danger! 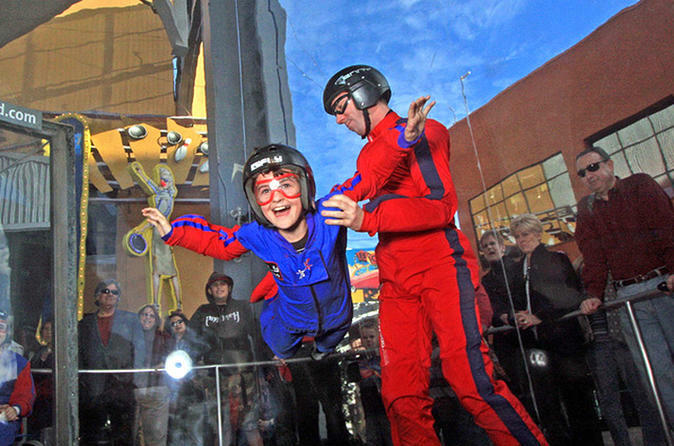 Head to iFLY at Universal CityWalk in Hollywood, a premier indoor skydiving facility powered by a state-of-the-art vertical wind tunnel. After a training session, you'll experience free-fall conditions with the help of an instructor. No experience is necessary and afterward, you can take home a personalized flight certificate. Arrive at iFLY Hollywood at Universal City (free parking available at CityWalk), and get started by putting on your gear and going through a specialized training session from an expert flight instructor. You’ll learn how to safely float in an 800-horsepower vertical wind tunnel that generates a wall-to-wall cushion of air — commonly used by professional skydivers — without having to jump from a plane. Just about anyone can fly, and no experience is necessary. The entire indoor skydiving experience takes about 75 minutes from start to finish. Each session includes up to twelve people, but you fly one-on-one with your instructor for 60 seconds in the wind tunnel twice. Special Offer - Book by November 14, 2018 and save 33% compared to the local supplier's price for travel on Monday through Thursday! - Book Now!